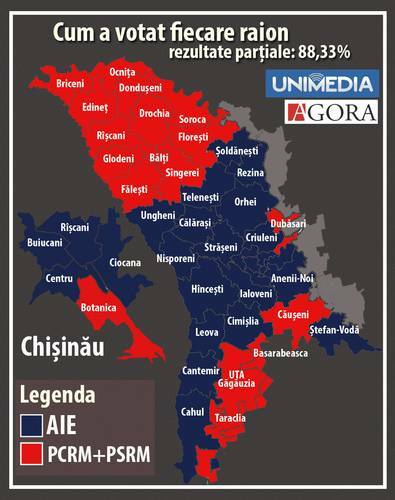 Center-right pro-EU parties clinched a narrow victory in the November 30th parliamentary elections in Moldova. However, the biggest surprise was the undeniable success of the Socialist party led by Igor Dodon. Socialists came in first with 20.5%, when all the polls were placing them merely on the verge of passing the 6% threshold. Apart from the obviously biased polls, which can only be partly explained by respondents’ shunning away from honestly expressing their voting intention, several other factors have contributed to the Socialist surge. The most obvious development that played into Dodon’s hands was the downward spiral that Communists have found themselves in for quite some time now. Communists lacked a clear message, enough resources, and were plagued by scandals. Besides, an aging Voronin is pulling the party down after propelling and keeping it up for almost two decades. Dodon, on the other hand, is the promising youthful embodiment of the leftist pro-Russian forces. Socialists had a much more credible anti-ruling coalition platform, plenty of resources, yet most importantly, the explicit backing of Moscow. 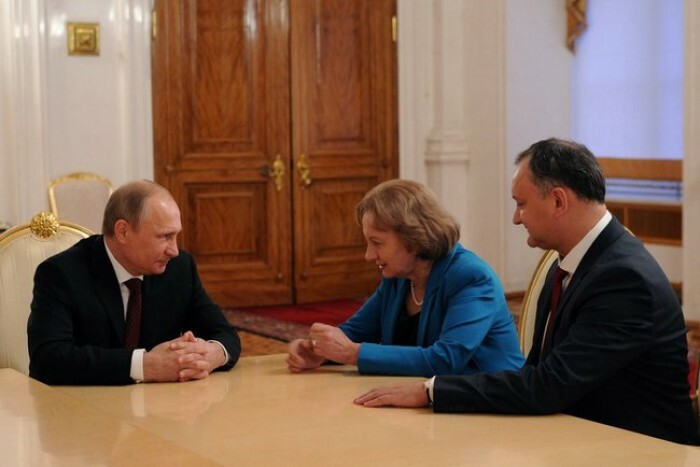 Dodon’s much publicized photo op with Putin immediately raised his national profile among Russian speakers. Dodon also monopolized the pro-Customs Union agenda, which assured him the overall lead. Dodon is also likely to have benefited from the other pro-Russian party’s exclusion. Center rights parties, understandably, took a hit, but were able to contain the potential devastating blow by proactively bending the rules and, when that turned out insufficient, did not shy away from banning a major contender from the race – Renato Usatii’s Homeland Party. Liberal democrats (20%; 23 seats), who held the Prime Minister position for the last five years, were expectedly hit the most – loosing nine seats. Whereas Democrats, who are equally to blame for government mismanagement and perpetual scandals, were able to gain four seats. This is where a quasi monopoly on media and virtually unlimited resources came into play, yet in that light, 16% seems modest. Liberals are big winners too. Despite only gaining one seat, they were able to regroup and consolidate their turf after the party split in April 2013, leaving PL with just five of its initial twelve seats in Parliament. Liberals are now poised to become kingmakers again, this time having a much stronger say when it comes to sharing the spoils. The bottom line is that nothing earth shattering has happened. As Nicu Popescu pointed out, Moldovans have proven to be consistent in their craving for change. Only this time, change took the form of highly populist pro-Russian parties, as opposed to moderately populist pro-European parties five year ago. Bear in mind that the highest scores of those who failed to reach the threshold belong to: Communist Reformist Party – 5%; Pro-Customs Union Block – 3%; invalidated votes, mostly cast in favor of the banned Homeland party – over 3%. Thus, we can safely conclude that the popular vote was won by the pro-Russian parties. Only bold strategic borderline legal actions taken by the ruling establishment ensured their stay in power. Thus, at the end, I would like to address the freedom and fairness of these elections. There is no question that elections were free in the sense that people were not directly compelled to vote one way or the other. Yet, were they fair? – Unfortunately not. Even before the campaign was on the horizon, the threshold was raised from 4% to 6%, mainly in the hope of leaving the Socialists out, ironically. The 6% threshold is one of the highest in the world. Only Russia (7%), Liechtenstein (8) and Turkey (10%) go beyond Moldova’s 6%, whereas the European average is about 4%. The Parliamentary Assembly of the Council of Europe recommends a threshold not higher than 3-4%. Then, if you take into account that the ruling coalition turned a blind eye on, if not actually encouraged, the creation of a clone party (same acronym, resembling symbol) meant solely to confuse communist voters, despite vocal protest by the latter. Not to mention that government earlier shut down the main opposition TV channel that served as a major vehicle for communist proselytizing. Also, government earlier banned seniors (major leftist constituency) from voting based on their Soviet passports. Finally, out of 95 polling stations opened abroad, only five were in Russia, even though there are a comparable number of Moldovan citizens residing both in Russian and in the West. All this contributed to the center right parties winning the election, yet still losing the popular vote. Moldovan left must now realize what Al Gore went through back in 2000 when he lost to Bush despite winning over half a million more votes. Is that democratic or not, you be the judge. To conclude, left wing parties are hardly the victim here, because their loss is ultimately of their own doing. They failed to win in a somewhat unfair, but still legal, game. Luckily for both, the left and the right, Moldovan voters have many virtues, but reflexivity, critical thinking and long term memory are not among them. Personally, I would prefer that pro-Europe sentiment had won fair and square, but needs must when the devil drives. Note: These are the rounded up preliminary results of elections (98% of votes counted). However, finals results will hardly change seats distribution. More election data at: Association for Participatory Democracy “ADEPT”. Distribution of seats in Parliament. Source: basarabia.md. This entry was posted in Elections, Igor Dodon, Moldova, Parliamentary elections 2014, Politics, Renato Usatii and tagged alegeri 2014, Dodon, Moldovan politics, Parliamentary election 2014, PCRM, PD, PL, PLDM, PSRM, Renato Usatii. Bookmark the permalink.